"Exarch" in the title of this unit is the bait -- something unfamiliar to pique the interest -- but we won't get to them for a while. We actually start way before the time of the Exarchs, but before we do, here's the familiar disclaimer: we clearly can't cover everything in this short survey of Eastern influences. Representative people and events will be included, and, along with them, info on where to find fodder for insatiable appetites for more knowledge. 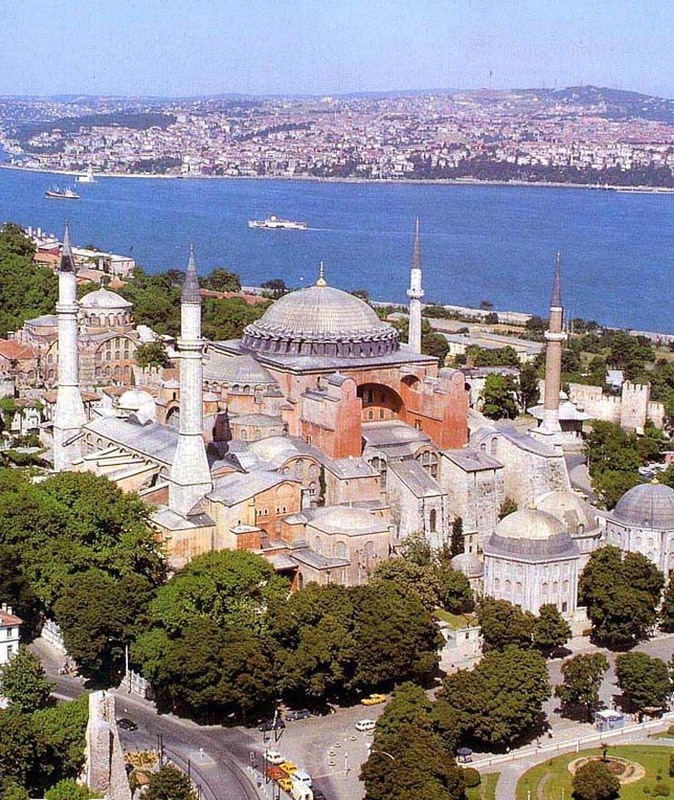 He was born in Constantinople in 331, and that's significant -- first "Byzantine" Emperor actually born there. Son of Julius Constantius, a half-brother of Constantine 1,the Great, and managed to escape the massacre of his branch of the family in Constantinople when Constantine died. Julian eventually was allowed to return to Constantinople, but then was sent away again in 350 to Nicomedea where he imbibed neo-Platonism. One of his teachers, Maximus of Ephesus, according to legend, prophesied that Julian would restore paganism. Constantius executed Gallus, a step brother of Julian (who had also survived the family massacre), because of Gallus' cruelty as a military commander and sent Julian to Milan as a state prisoner. Empress Eusebia got him permission to travel, and he studied more Greek philosophy in Athens, eventually being initiated three into the Eleusian mysteries. In 355 Julian was "rehabilitated" and presented to the Army as a "Caesar". He married the Emperor's youngest sister, Helena, and went of to Gaul where he was a very successful soldier and administrator. This once again scared the Emperor, who tried to remove some of Julian's troops. They refused to go and declared Julian Augustus. Julian sought to accommodate the Emperor but the Emperor demanded unconditional surrender, to which neither the army nor the people would agree. After trouble in the east ended, Constantius turned to confront Julian, but died while on the march. Julian advanced unopposed on Constantinople (in 361 AD). In 362 he went to Antioch to prepare for yet another war against Persia. While there he wrote his tracts against the Christians. In March 363 the expedition departed and was initially victorious. He advanced too quickly, overstretching his supply lines, and had to retreat. Persian mounted archers harassed his retreating forces. On June 26 363 he took an arrow in his side and died before sunrise the next day. Both Christians and Pagans believed the legend that sprung up immediately: Julian's last words were said to have been a cry that the Galilean (Christ) had conquered. This has been read as either a cry of despair or a recantation of his apostasy. Julian was the last of the Constantinian Dynasty. His good beginnings as an administrator in Gaul didn't last through his career, and when he was the sole authority he was "passionate, arbitrary, and prejudiced, blindly submissive to the rhetoricians and magicians" (Catholic Encyclopedia). Although no immediate influence -- his attempts to "re-paganize" the empire having failed -- many Western Christians and especially Romans placed their distrust of "the East" on his shoulders. They had already seen the Constantinian Dynasty decamp from Rome taking with it wealth, prestige, and political clout. Now, at the end of the dynasty, and just as the Romans were embracing Christianity, they had the spectacle of Julian's apostasy and attempt a pagan restoration to edify them. 2. Theodosius (346? - 395, Emperor 379 - 395) Goth pacifier, heretic persecutor, Pagan destroyer, dynasty founder Son of Comes ("Count") Theodosius, later called The Elder, and Thermantia, both "Nicaean" (i.e., non-Arian) Christians. Born in Cauca (now in Spain). Theodosius (The Younger, later The Great) had an early successful military career, but was forced into retirement after near destruction of his Legio Moesiaca in Valeria province in 374: he and two other local legionary commanders didn't work together to defeat Sarmatian raiders and took high casualties. Theodosius eventually drove back the raiders but was sent home in disgrace. Comes Theodosius was executed shortly thereafter, perhaps for trying too hard to have his son rehabilitated. Emperor Gratian (375-383) recalled Theodosius to service as Augustus for the East after the death of Valens (378), but it was his generalship that was really wanted. Theodosius immediately began his defense against Gothic incursions. By 380, he had pacified the Goths and held his triumph in Constantinople on Nov. 24, 370. But the pacification consisted of settling the Goths inside the Empire to serve as a buffer against other barbarians -- really a very risky strategy. Theodosius, in fact, continued to try to use barbarians against barbarians; there wasn't really much else that he could do. Among his Generals was Stilicho, and among the barbarians under Stilicho's command were Alaric and his Visigoths. Some modern historians have concluded that Theodosius simply pushed the barbarian problem westward into the other half of the Empire, and some go further conjecturing that he may have done so purposely with the purpose of destabilizing the West. Similar sanctions against the old pagans were carried out in earnest -- it was during this period that the Serapaeum in Alexandria was destroyed -- and troops were sent off in various directions to destroy the last temples and to break up rites. When Western Emperor Valentinian 2 was assassinated, his replacement Eugenius (a nominal Christian) tried to rally Rome's remaining pagans to his defense. Theodosius put down the revolt and wiped out all remaining paganism from Rome and the Italian Peninsula. Theodosius, apparently influenced by Ambrose in Milan, promulgated more laws against heretics and pagans and Jews. But Ambrose rebuked Theodosius over excesses, including, most famously, by banning him from entering the Milan cathedral after Theodosius' troops killed several thousand residents of Thessalonica in a reprisal, after a military officer was killed. Theodosius had to beg forgiveness publicly and perform public penance to get back in. This all happened in Milan, but that was then the Emperors seat in Italy, and Ambrose was a leading Bishop. Precedents obviously were set. Theodosius married Galla, a daughter of Valentinian 1, after his first wife died and by her had a daughter, Galla Placida. We've heard about her adventures before. Children by his first wife included Arcadius who became Emperor in the East and Honorious (a minor) who was emperor of the West under the guardianship of Stilicho. 3. After Theodosius: From this point forward, the Western Emperors were essentially figureheads, and Church and papal power grew into the Western vacuum. Romulus Augustulus (Emperor late October 475 - early September 476) Last Western Emperor -- not really an easterner, but his story follows on from the above, and the non-response of the East to his plight is very important. His father Orestes, who may or may not have been a barbarian, but who certainly had served as Attila's clerk/staff assistant, you'll recall, installed Romulus, as Western Emperor. Odoacer killed Orestes and put little Romulus under house arrest. Romulus, under duress, abdicated in favor of the Eastern Emperor Zeno (474-491) and Odoacer sent the regalia to Constantinople. That was the end of the Western line of Emperors. Belisarius was able to take Rome easily, because the Goths initially had an inept leader in Rome, a Romanized, i.e., softened, man named Theodatus, who was quickly killed by his own men while trying to flee. His successor Vittigis withdrew to settle a dispute with the nearby Franks before turning back toward Rome. The Pope, Silverius, had welcomed the arrival of Belisarius, a prudent move after witnessing the destruction in Naples when Belisarius took that town. When Vittigis came back over the horizon with his huge force, Romans were dismayed to discover that Belisarius would stand and fight and that Rome would be besieged. Belisarius walled up some city gates to avoid having them opened by Roman townsmen. A year long siege ensued with many adventures and a few misadventures for the Byzantines, but they outlasted the Goths outside the city, killing tens of thousands of them in successive sallies. The Goths during the siege destroyed the aqueducts, but the River still flowed, so there was water. Mills formerly run by aqueduct power were mounted on boats in the Tiber, and there were still such "river mills" until the dikes were built along the Tiber in the late 19th century. But although Belisarius had Rome, the Goths still had the "imperial capital" at Ravenna. In 539 the Goths offered to support Belisarius as emperor in the West, and he agreed, but it was a ruse to get his forces into Ravenna. Belisarius captured Vittigis and sent him back as a prisoner to Constantinople. But the ruse had scared the daylights out of Justinian, who recalled Belisarius in 541. The fact that Belisarius quickly returned to Constantinople should have reassured Justinian, but Justinian, who by this time clearly wasn't thinking very straight, kept Belisarius in Constantinople while the Goths under Totila (a nephew of Vittigis) took back everything except Rome. In 544 Justinian finally sent him back, but with an even smaller expeditionary force -- 4000 men. In 545 Rome fell to Totila, but he lost it to Belisarius again very quickly. Another Gothic siege was withstood in 546 but in late 549 Justinian recalled Belisarius again and this time kept him in Constantinople. Justinian was by this time more frightened of Belisarius than of any external (i.e., Gothic) enemy. The Gothic war dragged on for years. The Byzantines eventually wore down the Goths -- beat them by attrition -- but then came the Franks who just ate up the Gothic remains in the north. Unwilling to keep fighting, the Byzantines withdrew into Ravenna and to several other mainland and Island enclaves. Ravenna was to be ruled by an exarch. Destruction in Rome from the battles and sieges was immense, but as the population was also much reduced, this was not as big a problem for those remaining as it might have been -- it was still a big city with a small population and its "hinterlands" -- areas to produce food -- were inside the walls. The Romans also had learned that Byzantine "help" and "protection" might be more costly than it was worth, and a new protector would eventually be found to their west rather than to the east. But the process was delayed while the Franks got themselves organized -- and meanwhile, the Exarchate of Ravenna would "rule" and the Lombards would rise to fill the space the Goths had filled in the north. As Lombard presence increased, the Papacy, which became the temporal power focus in the Roman "duchy" of the Exarchate, supported the Exarchate as a way to keep the Lombards under control. At the same time, the Papacy also moved to protect the population of its own territories by raising and arming its own Roman militia. Popular support of the Papacy (even beyond its own territories) enabled Popes to defy the will of the emperor in Constantinople. In 715 Pope Gregory 2 was elected against the wishes of the Emperor. Nevertheless, the Pope and the Exarch still cooperated to control the rising power of the Lombards, who, on occasion, even had attacked Rome. But the Papal role was growing while the role of the Exarch was shrinking, particularly in matters concerning the defense of "Roman" territories, the city, lands around it, and papacy owned properties elsewhere. And by the end of the period the Papacy was the largest landowner in Italy. In 728 a crisis occurred in Ravenna -- riots over the question of iconoclasm. Ravenna had (and still has) some of the most important medieval art in Europe (especially the mosaics in the San Vitale and Sant'Apollinare churches) and its citizens weren't about to let the Byzantine "foreigners" destroy it. Their successful defense of their art against the Byzantines and Papal opposition to iconoclasm ensured the end of the exarchate. After Iconodule (image adulator) riots, it was clear that the exarchate didn't even control the city where it was headquartered. This emboldened the Lombards, and, at the same time, the Papacy needed a new ally. Pepin of the Franks emerged to fill this role after he deposed the last Merovingian ruler and that put the final seal on the Exarchate and Byzantine power in the Italian Peninsula. Iconoclasm was an old Judeo-Christian issue that bubbled to the surface in the Constantinople for internal political reasons as much as for religious reasons. Some contemporary and modern authorities traced Byzantine iconoclasm back to the concurrent Muslim version -- as if Muslims reminded the Byzantines of biblical injunctions. Others point out prior examples in the Judeo-Christian tradition as the trigger for both Islamic and Byzantine iconoclasm. There were clearly elements of both. Byzantine churchmen and Emperors, for a time, were iconoclasts and actively persecuted (tortured, killed, banished) their opponents and destroyed their images. As political fortunes changed iconoclasm waned. To some extent, this was a also a "monastic vs. diocesan" dispute in the east, and that colored reception of the issue in the West and especially in Italy, where monasticism already held a clear advantage. By the time Iconoclasm reached its dénouement in the east (the iconodules won) it was irrelevant in the west. The Lombards had permanently captured Ravenna in 752 (after a temporary capture from 726-28) and Pepin of the Franks had given the exarchate to the Pope in 754. (The exarchate was retaken by the Lombards the next year, but Pepin took it again in 756. It was part of what became the Carolingian Empire until 1218, but the archbishops of Ravenna who were nominally subject to the Pope autonomously controlled it. Details of how the dispute waxed and waned in the East are available in the handouts, which are drawn almost entirely from the Internet links below. It's hard to find the roots of the East-West Schism. A number of disputes led toward the split, but most authorities agree that the West thought that the East was effete and that the East thought the west was to "rough", i.e., uncultured and semi-barbarous. If they indeed felt that way, they were pretty much on target. We've already seen how the "iconoclast" controversy played out in the 8th and 9th centuries. Another dispute late in the 9th century was caused by the irregular appointment of a new patriarch for Constantinople (Photius, in 898) but that was just a manifestation of earlier troubles that went all the way back to 800 when Charlemagne was crowned "Emperor" in Rome. From the Eastern viewpoint, that looked like the Pope conspiring to set up a new rival to the Eastern Empire, and that would be a slap at the Byzantine Patriarch who crowned Emperors in the East. Leavened or unleavened bread for "communion"
Interestingly neither homosexuality nor pederasty was ever an issue -- nobody apparently felt qualified to cast the first stone. Despite the disputes at the top, most Christians felt a strong sense of solidarity and it took more than four hundred years for the opposing hierarchies to lead their congregations in opposite directions. Disputes had been solved before and anathemas had been withdrawn, so nobody thought the excommunication hurled (and they always seem to have been "hurled") by a hasty Papal legate at Patriarch Michael Cerularius would stick for long -- even when Michael hurled one back at the Pope. The cause was local and trivial -- to whom would abbots in "Latin" monasteries in the East go for dispute settlements. The Crusades quickly intervened, however, and physical violence replaced the metaphysical kind. Eastern Patriarchs at various times asked the Popes and the West for help against Muslim incursions, but neither East nor west had expected the mass appeal of the Crusades. It wasn't long before the Eastern Empire was being overrun by masses of "inspired", often hungry, sometimes greedy Crusaders. Even more worrisome was the fact that Westerners were soon ruling kingdoms in the East -- on territory that had been "Byzantine" before the Muslims had conquered it. The final blow to relations between Eastern and Western Christians came when Crusaders sacked Constantinople on April 13, 1204. Priests and soldiers raced through the Byzantine churches trying to get their share of the loot. The treasury of Santa Sophia Church and its golden altar are still proudly displayed in St. Mark's Cathedral in Venice. It wasn't until the 20th century that a Pope finally met with a Patriarch, and no real progress has been made despite claims by both sides that they want reunification. There are many sticking points, the largest still being the "primacy" of the Pope. From the beginning (and still today) both sides claimed to be the "real" Christian church and that the other side is "schismatic". Each side still seem to be willing only to accept the other side's profuse apology as a prelude to the other side coming back into the fold of the "true" church. Some theorize that the split "empowered" the Papacy -- it no longer felt the need to share authority and could therefore go on to become a major secular power in Italy and Europe (by which they mean "The West" -- as if the Byzantines were not a part of Europe or the West.) This, of course is ex post facto Western psychologizing. It's easier to explain it the other way -- already "empowered" rival Western and Eastern churches found ways to split. 8. Crusades -- often but not necessarily a military expedition of European Christians who set out to recover the Holy Land from the Muslims. There were also crusades into North Africa and Spain (Muslim territories), and the final sanctioned crusade into the Baltic area by the Hanseatic knights (devoid of Muslims but plenty of poorly defended Slavic land. Clearly we can't really discuss the Crusades themselves here -- another whole course for a later date! -- so we'll just throw out a few Papal and Western motivators. Those who didn't go -- for whatever reason -- contributed by paying taxes and making voluntary (and "voluntary") contributions with surprisingly few objections. Contributions could be individual or institutional, and were often made as investments that were expected to pay dividends in the future. During the period of the crusades, conditions and general wealth and well-being improved markedly in Europe. Many reasons have been adduced, the most popular this year being that the wasteful wars inside Europe were deflected outward (the war/anti-war argument) and the fact that new diseases hadn't been introduced to Europe for some time and an immune population existed (the "scientific" argument). Both of these led to a rapidly growing population (more potential crusaders!) but by the 13th century, either weather or over-use of land led to dramatic reductions in agricultural production and that was followed closely by the introduction of plague -- topics for later units. It's commonly said that the crusades introduced new knowledge into Europe as returning crusaders brought back long-lost information from the East and that this spawned the Renaissance. There is little evidence of this. New knowledge did come in from the Arab lands, but it's doubtful that it was brought back by crusaders. Most of it came in after the crusades when peace had been reestablished and travel again became possible because there were a number of liberal-minded Muslim Caliphs. Another impetus for the literary Renaissance in Rome was the fall of Constantinople to the Turks and the consequent flight of Greek Scholars to Rome.